I could not pass the opportunity to be a Guest Blogger for Minerva Crafts! So here I am posting a tutorial to make your own jeggings. I do love leggings but I’ve always wanted to have the comfiness of them but look a bit a smarter so why not have a go at jeggings! Plus it’ll also be my first pant garment construction so bare with me LOL!! I chose the Burda Ladies Easy Sewing Pattern 6926 as it is coming to the Autumn months but still look smart with ballerinas instead of my biker boots lol. As always make sure you launder your fabric prior to you starting to cut your pattern pieces out as this allows for shrinkage as it would be a complete shame not to do this before hand and to make these jeggings, wear it and love it then to put in the wash where it’ll shrink and they would be too small to wear! First open up the envelope and make yourself a brew and read the instructions and make a list of materials/equipment you need if you don’t have them already so no last minute dash to the local habersary store or waiting days for online orders lol. My choice of brew today is a Jasmine Green Tea and no biccie as I’m being a Good Girl for a change hahahaha! So when i measured myself for this pattern as I’ve never used a Burda Young Pattern before I’m measured as a US 12 Waist and US 16 Hips dam my curvy Derriere!! Lol so there’s some grading to do here :/ The Size Chart is on the actual Paper Pattern so i found it bit strange that there was no Size Guide on the outer packaging so i panicked a bit of what the sizing was like lol. 1.5m of Indigo Blue Denim Look Stretch Jersey Clearance Dress Fabric as its 60″ wide so I had plenty! Weights/Pins– for holding down pattern pieces in place. Now then, you can go ahead and cut straight into the paper pattern to the size you require (but if your like me and like to keep my paper pattern intact then trace your pattern onto the paper and to make sure you add any nothces/markings onto the paper then cut out and the 1.5cm seam allowance is already given in the pattern too. Also i like to overlock (if you don’t have an overlock stitch on your machine just use a small zig zag stitch that works a treat too) the raw edges that will in contact of me wearing the Jeggings i.e. the Side seams so they have a lovely soft edge to them and wont irritate you whilst wearing and also so you don’t have to fiddle around doing them whilst constructing the Jeggings together. Then press the Seam towards the pant piece and repeat on the other pant side and then Topstitch both using decorative thread (I’ve used a mustard yellow to represent a jean stylee) on the Pant Piece as close to the seams as you can. And repeat for the other pocket. Now onto the Side Seams, Nearly there!! Now to the Front Centre Seam, Place the Front Pant Pieces the Right Sides Together and pin, sew and press towards the left hand side of the pants. 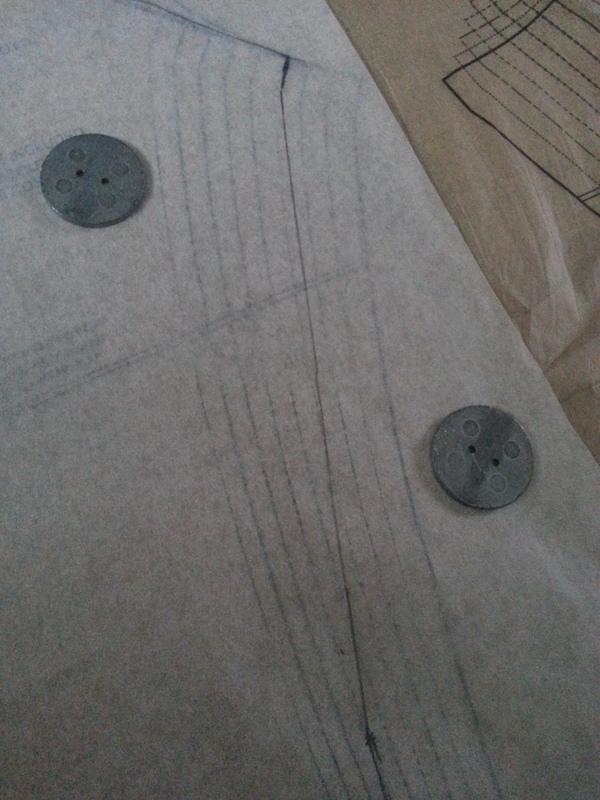 Now to join the Centre Back Seam, place the Back Pant Pieces Right Sides Together, pin in place and Sew. 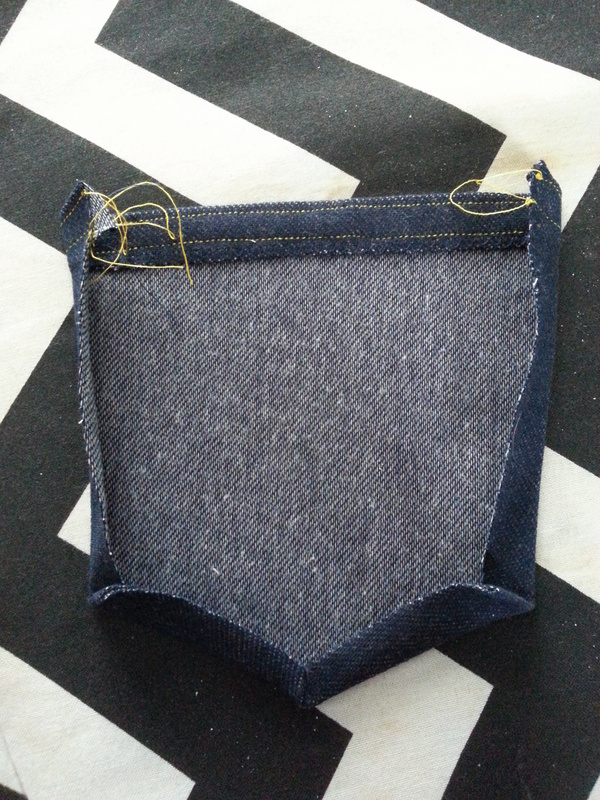 Then press the seam allowance to the left side of the pants and Topstitch close to the Seam. Now turn the Jeggings right way out and lets get on with the waistband! With the Waistband, Sew all along the fold line. Now pin the edges of the elastic with one side overlapping by about an inch so you have plenty of sewing space to make sure its secure and that you now have a loop. Place the elastic where we have just sewn on the fold line then pin in place and sew along the top edge of the elastic so it will stay in place along the fold line. 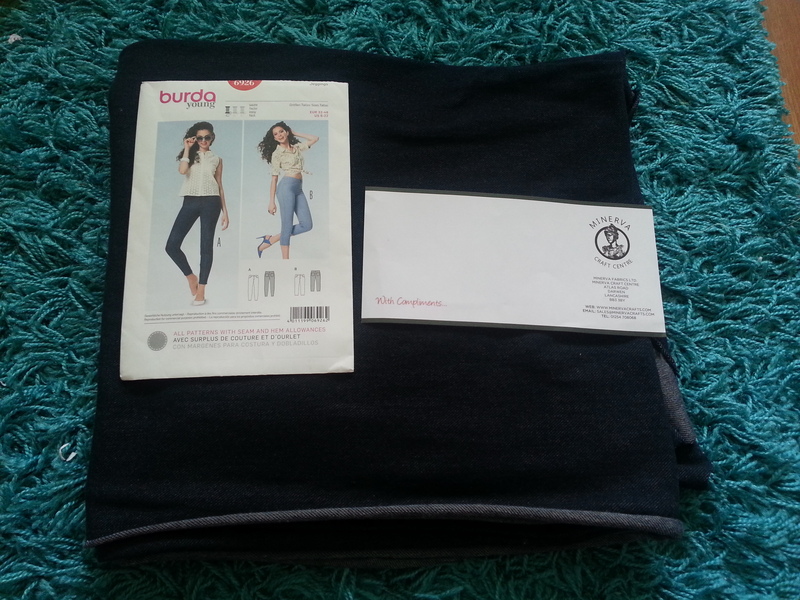 Then fold the waistband over and its now ready to sew onto the pants! Now with the Right Sides Together Pin the waistband to the Pants matching the seam of the Waistband to the Centre Back Seam of the pants and sew into place then press the seam allowance down. Now all that’s left is to the hem the legs!! Hurrah!! Now i tried mine on just to double check the length of them and thankfully they did and i stitched the hem by 1cm. And here we are a lovely pair of Jeggigs!! These are perfect for casual wear they are so comfy and a great fit! I’m so glad i graded back down to 12 from the hip along the leg as they would of been too baggy otherwise! And again a big thank you to Vicki at Minerva Crafts of letting me have this opportunity to blog for them 🙂 so go and get yourselves a nosey at Minervacrafts shop there is plenty of bargains to be had!